The Guardian recently reported on Micropasts, a British Museum crowdsourcing project that combines cultural heritage work and 3D printing (http://www.theguardian.com/science/2014/aug/18/volunteers-british-museum-crowdsourcing-archeology). The project uses crowdsourcing for transcriptions of object records and photogrammetric development of 3D object models. This project was supported by Joseph through volunteer participation based on his interest in digital humanities and his work with 3D printing at the Digital Commons of the DC Public Library in Washington D.C.
Be sure to check out Micropasts and their neat crowdsourcing interfaces. Also, be sure to learn about the Digital Commons and their 3D printing services. Oh, the most wonderful time of the year: conference season! When professionals the whole world over experience the joy of free continental breakfast, standing-room-only panel discussions, and odd luggage necessary to safely transport misshapen posters and displays through the TSA gauntlet. For me, the beginning and end of my conference whirlwind consisted of the Society of American Archivists 2014 meeting. Luckily, this year’s host city was Washington, DC. In lieu of a boarding pass, I grabbed my SmarTrip card and hoped down to Woodley Park for days filled with archival fun. Full disclosure: I am not, per se, an archivist. I am a graduate student specializing in cultural heritage information management with a focus on rare books, manuscripts, and medieval material culture. However, if my coursework has taught me anything, it is that the ongoing convergence of library, archives, and museum professionals — coupled with the ever-increasing technological synergy between these disparate institutions — means that it is incumbent upon us as information professionals to being engaged on several scholarly fronts. With this in mind, I felt that my participation in the SAA conference would not only help me in my own interdisciplinary efforts, but would also add a unique voice to the archival conversation that would occur at the conference. As writing about the chaos of conference life in some semblance of linear fashion is a herculean task, I will segment my comments by events, panels, discussions, or other relevant dimensions. Before the official kick-off of SAA, a pre-conference workshop was held that explored the use of open-access applications for optical character recognition of non-standard texts. Led by Matthew Christy of the Early Modern OCR Project from Texas A&M, this workshop provided extremely helpful insight into the workflow for training Tesseract to identify and convert early modern print types into computer-usable text. On a personal note, this was a whirlwind of new information to the uninitiated OCRer (i.e. me). However, knowing what I do now, I think that this was an excellent professional development experience that will be useful on future projects. FOIA and Access: The plenary discussion featured a lively discussion on the importance of FOIA to the realm of investigative journalism. A fantastic – and timely – discussion that highlighted the importance of archivists as both holders of information and conduits of access. Integrating Digital Objects and Finding Aids: As with all panels focusing on digital materials, this panel was packed. This panel, focusing on the Northwest Digital Archives, presented great ideas on approaches to ensuring object-collection hierarchy maintenance; use of publicly available resources as service hubs for private collections; and approaches to user testing. SNAC: Representatives from the SNAC project led a great discussion on the development of linked EAC-CPF records to help unify entity identification in distributed record holding institutions. Again, another jam-paced session due to the digital orientation of the topic. Still, a great opportunity to learn about ongoing initiatives. 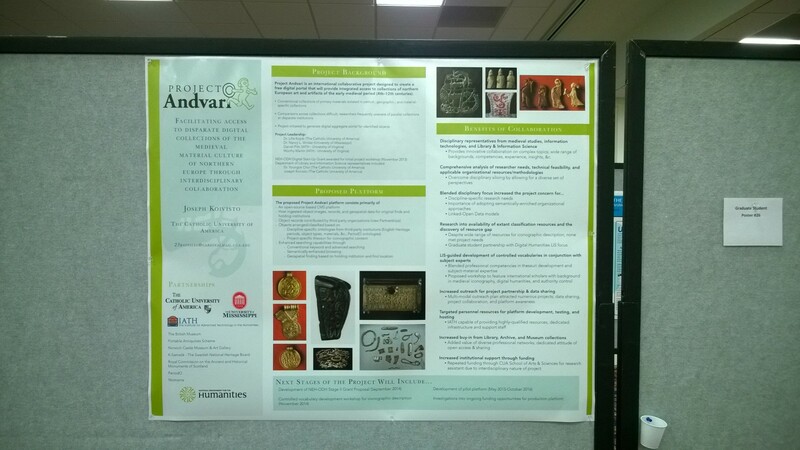 The poster session was an excellent opportunity to meet a variety of scholars and professionals and to give them an introduction to my work on Project Andvari. A lot of very fruitful conversations occurred. A couple even led to possible partnerships for future collaboration and data sharing (and a possible job opportunity, but let’s not get too hopeful). All-in-all, it was a great chance to practice my presenting skills and to get my face out there as a participating member of the larger scholarly community. Conferences are always hectic (and exhausting). There is always far too much for one person to experience, but the net effect is one of great professional development and scholarly sharing. This year’s SAA conference was no exception. 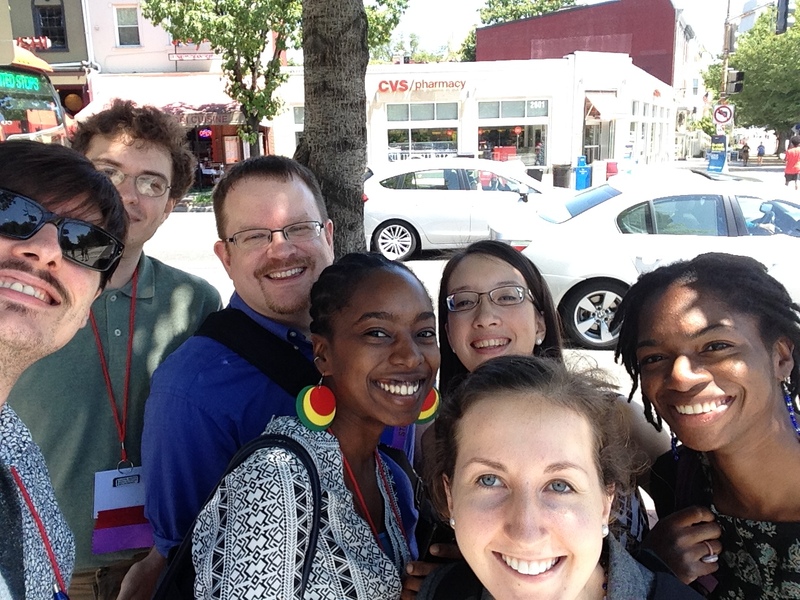 I walked away from this experience enlivened with a renewed energy for my professional field. While I couldn’t attend more sessions, I was extremely grateful to my fellow conference attendees and their dogged upkeep of the #saa14 thread, allowing me to follow the numerous concurrent sessions that I could not attend. As I near the end of my graduate coursework, I am excited to more fully enter in to my chosen profession, knowing that the field is populated with such energetic and innovative professionals. 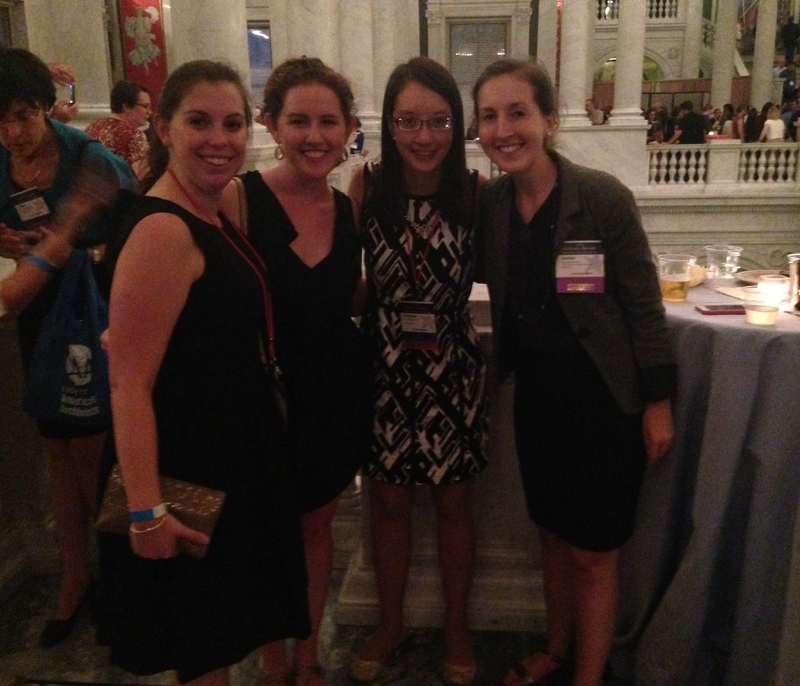 For a relatively new member to the archives field, it was the early pinnacle of my experiences in the occupation to be able to attend my first ever Society of American Archivists conference in D.C. last week (August 10-16). Due to conflicts with my schedule and other responsibilities, I was able to only attend for one day, that being Friday, August 15. However, I was still able to experience in a brief period most of the daytime events that the conference had to offer: presentation sessions, poster sessions, vendor exhibits (with free food! ), the bookstore, and, perhaps most important for me that day, the career center, which will I speak on later. The other benefit for me going on Friday was that I was able to use the morning sessions I attended for two purposes. Obviously, the sessions were part of my conference experience and useful to my future work in the archival field, but it also served to provide information for a project I have recently been asked to undertake as part of my position as a graduate research assistant at the Catholic University Archives. Our archivist and director Dr. Timothy Meagher has asked me to research the websites of other archives offering digital primary materials, either as part of an educational program or simply a digital repository, and examine literature on archives and education in an effort to compare these examples with our own program, the American Catholic History Classroom, a series of digital primary source exhibits that provide a Catholic perspective on topics in U.S. history. The two sessions I attended on Friday both concerned this issue, at least tangentially. In session 304, Reach Them and They Will Come: New Approaches for the Archival Educator, educators from institutions of higher education and K-12 schools, offered their ideas on how they used primary sources in their instruction. Malinda R. Triller Doran of Dickinson College described a program in which primary materials from the campus archives were set up in stations with students asked to match related items and place them in order by date at a way to show how information is communicated through various formats. Jeffrey W. McClurken of the University of Mary Washington described a digital project in his U.S. Women’s History courses, wherein students researched archival materials at the university to learn what life was like at the formerly all-women’s college in the mid-20th century and create a website of these experiences. The second session, Learning to Teach and Teaching to Learn: Instruction and the Use of Primary Sources, archivists and special collections practitioners presented ideas they used for providing instruction in the use of primary sources to students, as well as instructing archivists on how to provide such information. Mattie Taormina of Stanford University argued on this latter point that there should be more of a focus on instructional pedagogy for archivists, either through self-education (online courses, workshops, etc.) or, perhaps even more revolutionary, adding a focus on pedagogy as a core element to a archival graduate program. Anne Bahde of Oregon State University discussed a program in primary source literacy skills for U.S. history classes that taught students to identify and evaluate primary sources, focusing not only on source content but also on archival techniques involved in preserving those materials. Elizabeth Yakel of the University of Michigan discussed evaluating primary source instruction, arguing that such as evolved from orienting students to the archives to primary source introduction and now to ensuring that students engage in critical thinking with sources. The sessions were integral to work, and also provided me with ideas to consider as far as what I can offer as a professional once I attain the position(s) that I want after school. My time at the career center, however, provided perhaps much more from a practical standpoint. While I didn’t have the chance to interview with any organizations, I did get the chance for the first time to have a professional review and give me tips on creating a proper archival-focused resume. I want to thank here and give credit to Lauren Goodley from Texas State University for taking time to show me what was good and (mostly) what was not in my current resume so as to make it more readable and more likely to not be overlooked due to length and unnecessary information. It is my hope that such assistance will prove valuable in my search for full-time employment in the field. In addition to the above, I had the opportunity to spend time with fellow CUA LIS students, exchanging ideas and experiences over coffee and tea (and music from the 1980s that was playing just across the street). It was a worthwhile experience that I encourage anyone in the field to attend whenever possible. The information, career advice, and camaraderie cannot be measured in dollars or time; I believe I will measure it in the coming months and years in terms of knowledge acquisition and career success. As part of the stipulations of our grant funding, we are required to complete a practicum project at a cultural heritage information institution here in the Washington, DC area. I opted to complete my project over the summer at the Library of Congress Preservation Research and Testing Division (which is primarily why you have seen next to no blog activity from me during the whole summer). I’ve just completed my project and will summarize some of the larger points of my project. The project was a portion of the CLASS-D development initiative that is ongoing at the Library of Congress PRTD. CLASS-D, which is n acronym for the Center for the Library’s Analytical Science Samples — Digital, is a tasked with developing a functioning database prototype to provide access to sample and analysis metadata for the materials contained within the PRTD’s CLASS collection. A little background: The CLASS collection is a small body of diverse materials that have been set aside for preservation laboratory research via both noninvasive and invasive (i.e. destructive) techniques. These materials include books (the Barrow books, acquired from the W.J. Barrow Research Laboratory), standard paper samples, TAPPI fiber samples, magnetic tape, and more. These samples undergo a wide variety of laboratory analysis such as microscopic imaging, environmental scanning electron microscope imaging, pH analysis, spectrometry, accelerated aging, &c. Through this ongoing analysis, these samples have generated a great deal of important information on the physical characteristics and aging profiles of a variety of materials of different ages, periods, and production techniques, providing important information on the preservation of cultural heritage materials. The problem: Now that PRTD has all of this information, how do we disseminate it? Initial work on the project was completed by Doug Emery. This work ultimately produced a final report filed with the LOC that makes recommendations for data modeling and DB architecture. Based on the work completed for this report, I was tasked with completing the initial prototyping of the actual database in order to prove 1) the appropriateness of the initial data modeling work and 2) the feasibility of the database itself. For those of you unfamiliar with what summer at the LOC is like, let me set the scene: imagine scores of junior fellows and interns meandering the halls, using laboratory space, needing supervisory assistance, all working on different projects across all departments at the LOC. Sound crazy, right? Within the Preservation department, there were at least a dozen scholars on-site throughout the summer working on a variety of in-depth research projects. While this sort of jam-packed work environment is great for innovation and learning new things, it’s not that great for being able to meet one-on-one with a supervisor. Dr. Fenella France, my most gracious host at the LOC, was pulled a million different ways throughout the summer due to her own professional responsibilities and the overabundance of junior researchers. For me, this was a bit of a wake-up call as my professional background has been in environments in which supervisors exerted close control over the work being done by their underlings. For the first time, I found myself doing a large amount of self-guided work without regular in-depth check-ins from the higher ups. This meant that I had to not only had to consciously guide my own schedules and progress, but that I had to also push to have my work reviewed in order to assure that my work and our overall project goals were in alignment. While this took a bit of schedule wrangling on my part, it did lead me to realize that you have to campaign for yourself and your project so that others will provide you with the proper attention and consideration that is required. The PRTD is largely a laboratory research institution. And while they have made huge strides towards serving their information needs and those of external researchers (i.e. CLASS-D), others within the institution simply are not as conscious of LIS issues as myself. This means that when specific researchers are asked for sample metadata, they aren’t necessarily going to provide it in neat, ordered, standard-compliant formats. This, at first, was extremely frustrating because it meant a great deal of data massaging and manual ingest in order to introduce the pilot data into the prototype. Is there a way to raise awareness on these issues? Yes. Can you use those tactics in every scenario? No. Do you need to understand that part of interdisciplinary system development is going to be dealing with others’ disciplinary focuses? Absolutely. Rather than being standoffish on these topics, think of yourself as a conduit through which data can be organized and provided with usable value. Be willing to communicate openly with others in order to help create the greatest level of user service. Check Your Data Model. Check it Again. Putting in Pilot Data? Check it Again. It may go without saying, but always, always, always double, triple, and quadruple check your model before you begin ingesting actual data. You never know what simple mistake you’ve made that will ultimately require several hours of undoing down the road. Luckily, this mistake only ate about 8 hours of my time. But, I would rather not have to waste time because of simple oversight. You’ll Never Suspect to Find Interdisciplinary Collaboration… Until You Do. To be perfectly honest, I did not want to work at the LOC. I do not have a science background and was much more interested in several projects more associated with codicology, rare book cataloging, and the like. However, having accepted the LOC project out of necessity, I later discovered that here — in the field of laboratory science — is fertile ground for collaboration with the LIS discipline. The innovative approaches that our field is bringing to the development of information systems and to the practice of data sharing have found a great deal of support and buy-in from the humanities and social science disciplines. And while there is not a lack of interest from the life sciences, there exists a gap between our professional discourse and our applied exercises. Once I arrived at the PRTD, I found several people who were extremely interested in taking advantage of new approaches to data management and sharing. However, given the disciplinary focus of their institute and their own professional responsibilities, they had not yet been able to seek out partnerships or support from LIS professionals. After talking with several PRTD representatives about the possible implementations of the CLASS-D initiative, I found that they were extremely interested in the benefits that could come from having an open access database and the possibilities of implementing RDF-compliant data modeling to promote innovative reuse of data. Despite coming in to the workspace with my own professional preconceptions, I found the PRTD to be an excellent institution, filled with possibilities for creative collaboration between the laboratory science and LIS disciplines. While we may harbor hopes and dreams for what type of institution we may end up working for, be sure to remain open to unforeseen opportunities that may offer you a chance to dramatically impact the mission of a collection, an institution, or a profession. There will be more to come from the CLASS-D project. Up next, Nick Schwartz will begin working on modeling for the analysis metadata architecture that will attach to the existing architecture. Keep an eye out for more updates! If you are interested in learning more about the CLASS-D project, feel free to contact me at 23koivisto@cardinalmail.cua.edu. Oh my gracious, look what I found. Stuffed into the bookshelves of my local antique junk store, waiting for discovery, hid this treasure of a pamphlet: an undated “Guidance Bulletin” for DC public schools. Just how much of an actual “treasure” it is I don’t know – maybe the Washingtoniana Room at the MLK branch of the DCPL is overrun with the things – but to me, it really is a treasure. But this isn’t the only school featured in the pamphlet. One can also read about Cardozo High School and Dunbar High School (both of which many DC kids still attend today). Many of the school buildings discussed in the work are now listed on the National Register of Historic Places. A review of the classes advertised shows that boys could look forward to classes in Electricity, Shoe Repair, Engineering, and Chemistry. They might pursue occupational tracts like Auto Mechanics or Auto Painting, Electrician, Printing, or Sheet Metal Making. Girls could take classes in Home Economics (Food or Clothing), Nursing, Child Care, and Dietetics. Potential careers would include Household Arts, Dressmaking, Laundress, or Chef. If you are still not seeing why I’m excited, I’ll try to explain – wouldn’t this pamphlet make an unbelievably fantastic classroom resource for teaching local DC history? Kids connect to things that they can relate to. What’s more relatable to a kid at school than, well, other kids at school? Other kids from long ago that attended some of the same schools still attend today! As I explained in an earlier post about primary sources in K-12 education, kids often need extra mediation in order to fully understand an historic resource. So just handing out these pamphlets to a Social Studies Classroom and saying, “Go!” probably wouldn’t do anything. In order to make it an effective teaching tool, other resources would be necessary. But think about all the topics this little pamphlet covers or supplements: Booker T. Washington, segregation and desegregation, race and gender discrimination, the sphere and/or cult of domesticity, education, historic preservation, and the role of these schools in the community. This pamphlet was geared towards African-American students. Was there a similar one for White students? Would the contents be different? If a more accurate date were established, would students have photos of their family members from that period of time? Would period job postings or product advertisements shed light on gender discrimination? What if we added letters or photos of Booker T. Washington when discussing his work and views on education? The possibilities seem endless! And maybe not all of them would be successful. But this is the kind of material that is perfect for K-12 education – and I’m really nerding out about it.